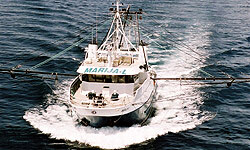 Wearing the distinctive Puglisi livery of cream, tan and brown, ‘Beauie J’ is 22 metres of purpose built prawning power. 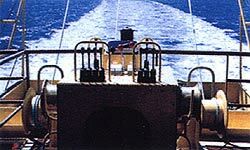 However, her sister ship, the Angelina, she is also set up for towing tuna cages. It was in this guise that she sea-trialled within three weeks of launch. 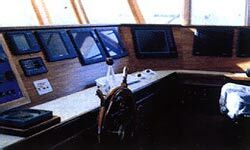 ASCI’s continual improvements and higher levels of excellence in all stages of ship construction since their first James designed the “New Generation” trawler was launched seven years ago have ensured an almost flawless vessel. Several “land lubbers” aboard were surprised at just how stable, smooth and comfortable ‘Beauie J’ had proved to be. Sure conditions were comparatively calm, but as Andrew noted from his experiences aboard ‘Angelina’, this new vessel would look after its crew in foul weather too. ‘Beauie J’ passed her sea trials with flying colours and impressed all aboard with her built-in professionalism, comfort performance and stability. 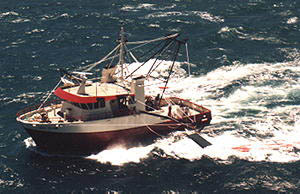 She joins 51 other trawlers which comprise the S.A., prawning fleet. 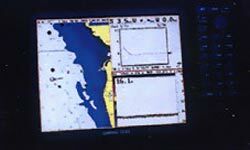 Of these, 39 operate in Spencer Gulf three from Coffin Bay to Ceduna and the remaining 10 in Gulf St. Vincent. 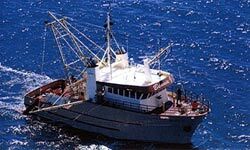 This remarkable industry, the first such in the world to adopt the principles of self-management, produced 2,600 tonnes of prawns worth $46 million in its last season. Even more impressive is that for the fifth year in succession catches have steadily increased, a direct result of effective, applied resource management. Small wonder too that, at time of writing ASCI was expecting to confirm orders for a further two “New Generation” trawlers.